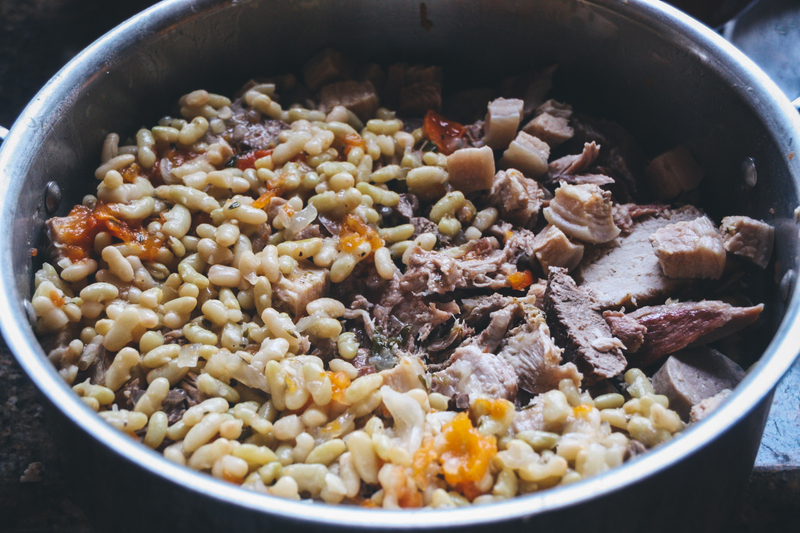 I think the first time I heard anyone mention cassoulet, it was Martha Stewart years ago in the first version of her television show. Outside of remembering that the main ingredients were white beans and a huge amount of meat for what could be classified as a one pot meal, I know she described it as one of her traditional holiday party menu items. I also remember wondering how a preparing a pot of beans could be so involved. Really? To say that cassoulet is simply a bean stew or “dried beans and meat” is humorous because I grew up eating what could be called bean stew. Beans go in a pot with few additional ingredients and not much attention. Time goes by and a tasty dinner is served. Bear in mind that in this scenario, the bean to meat ratio is in favor of the legumes. Cassoulet is anything but that, but I’m thinking it shouldn’t have to be. At the same time, if I set out to make one of the many recipes I glanced at for “easy” cassoulet I’d feel I’d cheated somehow. Perhaps I’d have something with flavor similar to cassoulet, but I’d miss out on what I often enjoy so much about tackling an involved recipe for the first time: all the thinking I do. There’s something very gratifying about methodically working through a recipe that takes some thought and effort. I’ll confess this all began with a small jar of duck fat I brought back from England recently. I saw it and knew it would remind me of all the possibilities, so tucked it well into my suitcase until we arrived home, then stored it in the fridge to think about. Many traditional versions of cassoulet are made with duck fat, but I needed a recipe that wasn’t swimming in it, which means I would need to choose a recipe lacking in, well, duck — or more specifically, duck confit. My little jar’s quantity wasn’t nearly enough to make that. Some may say a duckless cassoulet is sacrilege, but I know the recipe I chose, which uses tomatoes and a bread crumb topping, could also invite that complaint. Cassoulet is a dish originally from the Languedoc region in Southern France, with the towns of Castelnaudary, Toulouse and Carcassonne all claiming credit for its creation and there are as many variations as there are village cooks in that region. 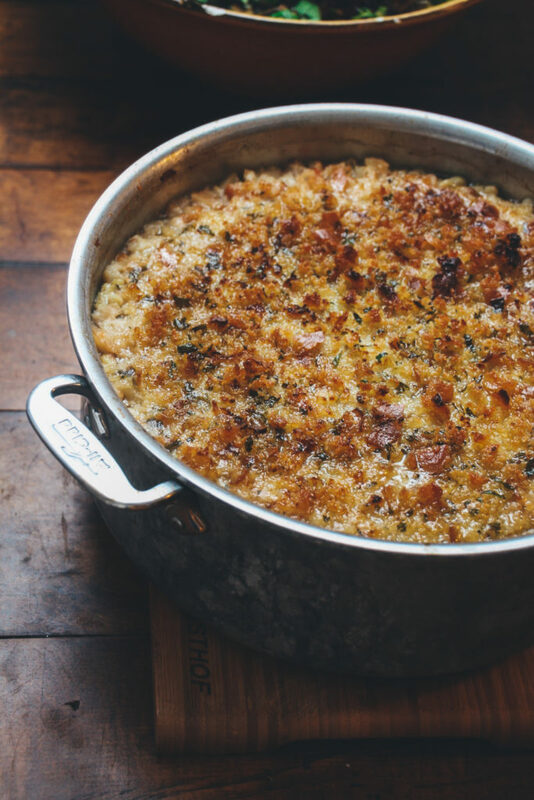 Originally, I’d considered floundering through a Toulouse Cassoulet until I came to my senses realizing I hadn’t the time I needed to construct it. I made the cassoulet, but I confess that I did not break the “film” that develops over it while it cooks seven times, so evidently, I did not create anything perfect. Rich, yes. Perfect, no. With respect to all that’s good about home cooking, and for someone like me who truly enjoys the process of constructing a dish like this, it’s a great reason to gather a group of special friends for a special meal just because. Especially on a cold winter’s day. Prepare the beans first. Check for stones or bad beans, rinse and drain. 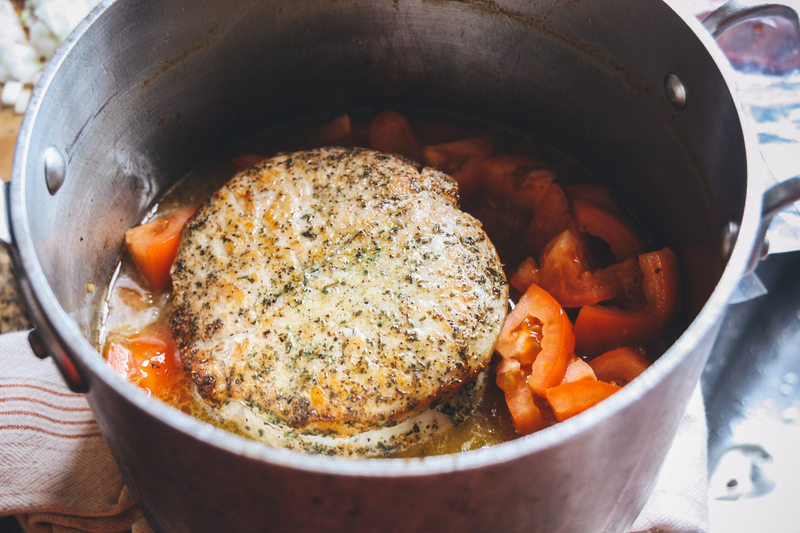 Pour into a medium sauce pan and cover with cold water by 3″. Cook over high heat until boiling, then reduce heat and simmer about 30 minutes until softened. 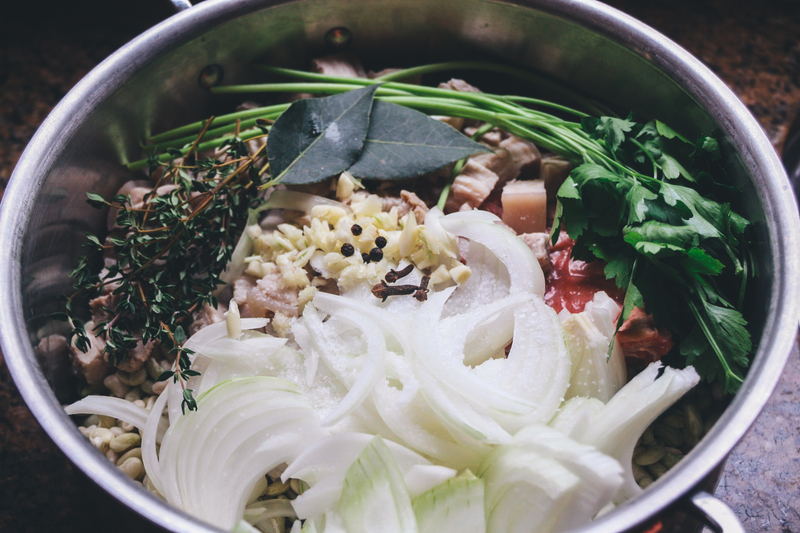 In another sauce pan, cover the pork rind and pork belly with cold water by 3″ and bring to a boil over high heat. Reduce heat to medium and cook for 20 minutes. Pour out the water and rinse with cold water twice. Cut into 1/2″ cubes and set aside. Prepare the lamb. In a large heavy pot warm the fat or oil over high heat. Add the lamb, browning on all sides, 5-8 minutes. Add the onion, garlic, and spices, mixing well. Add the wine to the mixture and reduce the heat to low, cooking about 1-1/2 hours until meat is tender. 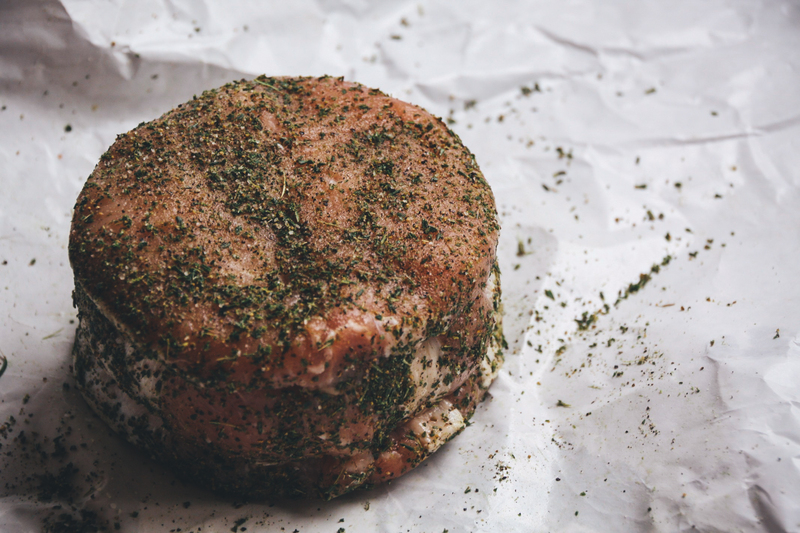 To prepare the pork loin, rub well with salt, pepper, thyme, and rosemary. 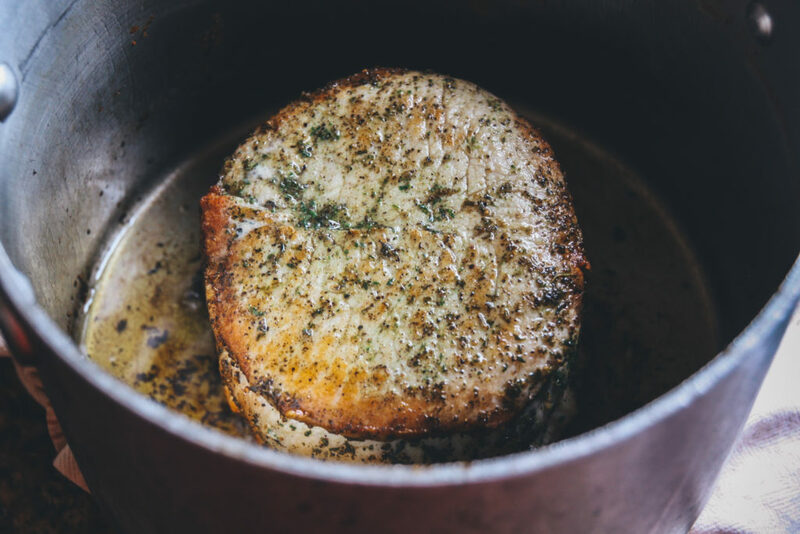 In a Dutch oven or large, heavy pot, heat the fat or olive oil over high heat and brown the pork loin on all sides — about 8 minutes in all. To the pot, add onions and garlic, stirring for 1-2 minutes. Add tomatoes and 1-1/2 c. of the wine, reduce heat to low and cover, cooking until meat is tender, about 1 hour. Prepare beans. 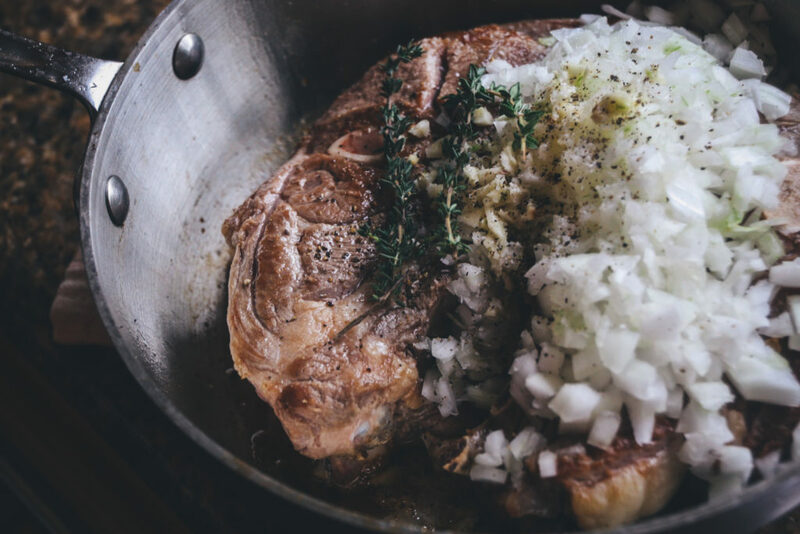 In a large pot, place softened beans, pork rind, pork belly, bones from the loin, onions, garlic, parsley, thyme, bay leaves, peppercorns, cloves, and salt. Pour in 3-1/2 water and bring to a boil over high heat. Turn the heat to low, and cook for about 1 hour, uncovered. Once the pork loin is ready, remove it from the pan and add it to the bean pot. To the remaining pork juices, deglaze the pan over high heat by adding the remaining 1-1/2 c. white wine making sure to scrape up any brown bits from the bottom. Boil the liquid until reduced by half, then pour into the bean pot. When the lamb is ready, scoop out pieces with a slotted spoon and add to the bean pot. Set the remaining lamb cooking liquid aside. Now add the sausages to the beans as well and continue cooking the entire pot for an additional 30 minutes. 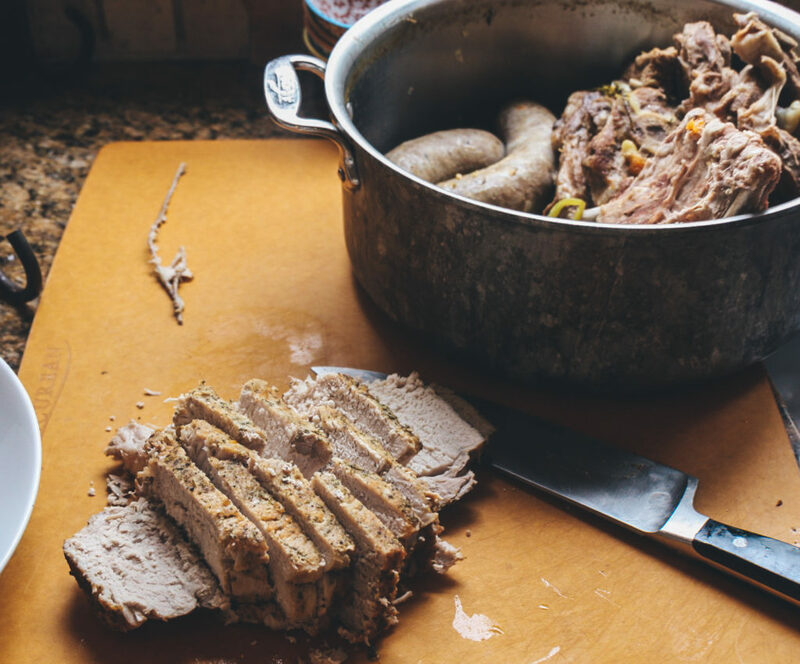 While the bean and meat mixture is cooking, preheat the oven to 375 degrees F.
When the bean and meat mixture is finished cooking, remove the pork loin, pork belly and sausages from the beans to a cutting board and cut them into 1/2″ pieces. Set aside. With a slotted spoon, remove lamb pieces from the beans to the same plate. In a 3-1/2 to 4 qt. baking dish or oven proof sauce pan, add a 1″ layer of beans to cover the bottom of the pan. Add a layer of mixed meat pieces, making sure to distribute types evenly. Cover the meat mixture with another layer of beans, add another layer of mixed meats, and finish with a layer of beans. Carefully pour in the lamb juices and enough bean broth to barely cover the top layer of the cassoulet. Mix the breadcrumbs and parsley, then sprinkle evenly over the top of the cassoulet. Finish by drizzling the duck or goose fat over the crumb topping. Bake uncovered for about 15 minutes until a crust has formed. At that time, use a large spoon to break through the crust, spoon out some broth and pour over the crust. Bake an additional 15 minutes, and repeat. Bake until crust is richly browned, about 15-20 minutes. The recipe I used was adapted from Georgeanne Brennan’s Savoring France which is a Williams-Sonoma publication — a beautiful book I have enjoyed for years. The list of ingredients above is written exactly as published, but I’ve resorted the directions for the recipe to an order which I strongly believe streamlines the process now that I’ve tried it. Martha Stewart’s Cassoulet for 100 (immediately disqualified for obvious reasons) from The Martha Stewart Cookbook (1995 1st ed). Not only did I lack 94 mouths to feed, I can’t imagine where I’d get the pots, pans, and refrigerator space to create a dish like this for that many, starting with the 16 pounds of beans. Goodness. 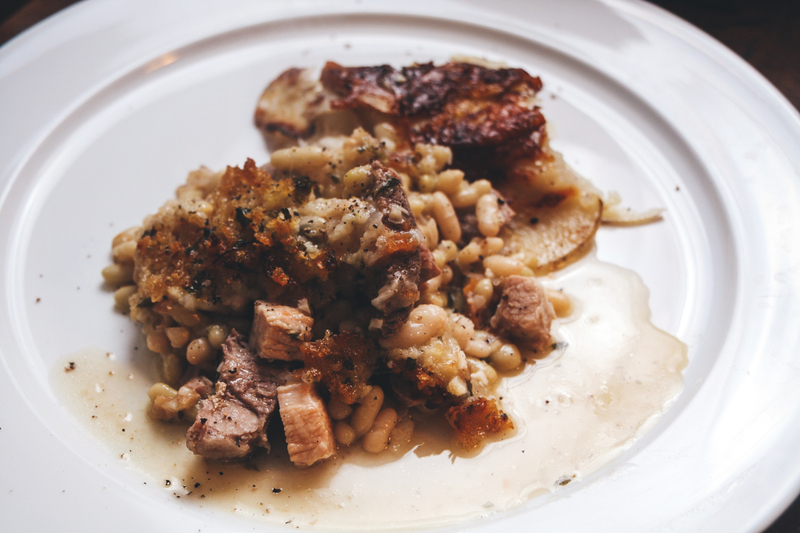 Julia Child’s “Cassoulet de Porc et Mouton” from Mastering the Art of French Cooking is very similar to the Brennan version (or vice versa) I made. The biggest differences are: 1) roasting the pork loin, which makes much more sense to me than braising considering it’s a lean cut of meat; and 2) an included recipe for homemade sausage cakes instead of traditional Saucissed de Toulouse, which although tasty sounding, would only require more time and better planning. She does provide additional variations or substitutions which are great. But Julia is always great, isn’t she? As much as I truly wanted to try Paula Wolfert’s “Toulouse-Style Cassoulet” from Food & Wine, it was even more involved than the one I chose, and required more than a day to construct. I knew this after having tagged it when it was first published, but in the end, I went with a cassoulet that could be prepared and eaten in one day. Take the time to peruse her list of ingredients as a comparison. It’s an interesting variation. The New Jersey Monthly published executive chef Dominique Filoni’s “Cassoulet Toulousain” earlier this year and I like the sound of it quite a bit, but couldn’t pull off the duck confit in the time I had. It’s definitely one to save for later. Here’s a version published in the New York Times in 1992 which also includes the duck confit. It caught my eye because the ingredient list is somewhat uncomplicated. Etienne Rousselot’s Cassoulet as published in a Saveur adaptation is the version I will experiment with next, and there will be a next time. The ingredient list is manageable, it contains the duck confit, and serves fewer. I like the head of garlic in the mix, as well as the use of ham hocks. I love ham hocks. I did scan quite a few French translations just to consider authenticity, and although the ingredient lists and directions seemed much more simple, some things seemed to get lost in the translation and I wasn’t feeling that adventuresome. If you’re someone who just doesn’t get the whole point of spending a day or two — or three — constructing a pot of food for dinner, and wonder why cooking always seems so complicated, here are links for quick and easy cassoulet — 27,000 of them. I have my own version of this coming soon inspired by a dish I enjoyed at The Crown Inn in Linton, Cambridgeshire, England when we were there this past October. I asked the waiter if the chef might share the recipe, but never got response. Oh well, right? The guys at Seisel’s Old Fashioned Meats in San Diego were very helpful. Because I couldn’t get the ribs with the pork loin, they suggested a similar quantity of baby back ribs which worked perfectly. They also had a frozen piece of side pork with the skin attached, so I was able to use that instead of the lean belly meat and separate 1/2 lb. of rind the recipe calls for. I also used lamb shoulder chops instead of the boneless lamb shoulder. I browned the chops and put them in the beans whole so I wouldn’t have to sift out the diced pieces from amongst the beans which seemed beyond ridiculous. Can you even imagine doing this? Bristol Farms had the French pork garlic sausage, and for later use, I was also able to purchase the duck legs. I used flageolets for this recipe, worrying about the tenderness of small white beans, which I know would not stand up to all of the cooking. 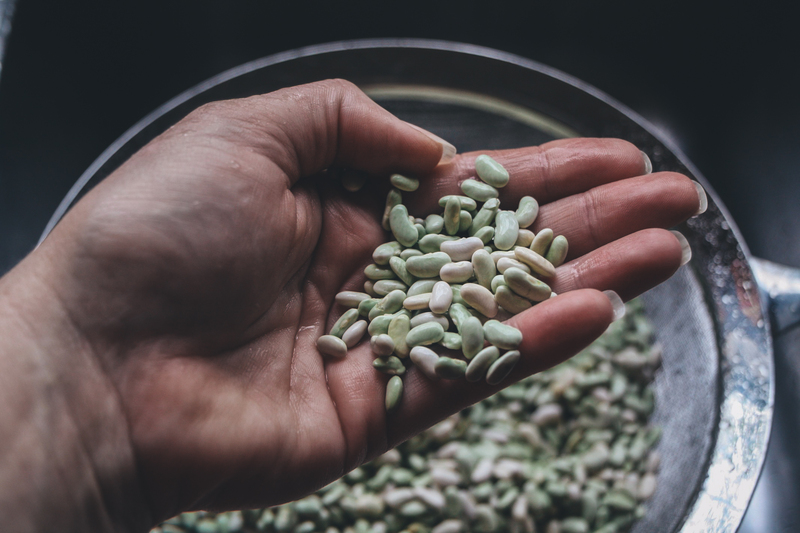 Flageolets are a French variety of bean harvested when they are still green and traditionally served with lamb. They’re pricey by general bean standards, at about $6.00 per 1 lb. bag. They hold up fairly well in this recipe, although there was a bit of breakage. Cutting back 15 minutes on the initial cooking time for the beans would help prevent this if it bothers you to have beans that aren’t perfectly shaped when you serve them. I soaked 2 lbs. of flageolets, and used all but 1 c. saving that remainder for another use. I used a very inexpensive Pinot Grigio for this recipe because before wine, the tab for the main ingredients was already $70 — counting the duck legs I ended up not using. Before you fall over in a dead faint, do the math: it comes out to about $6 per person, and for the excellent ingredients and labor, that’s a pretty great deal. Remind me about how much a super-sized combo meal costs at a drive-through burger joint. 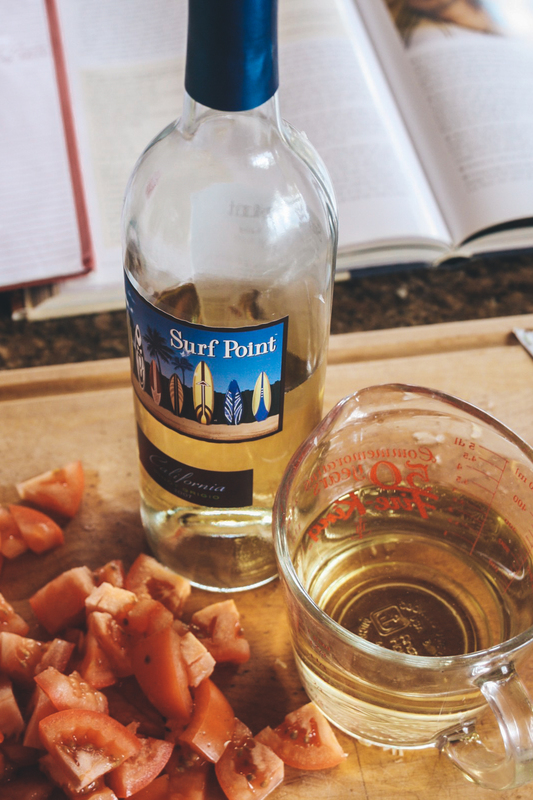 On the wine: I try very hard to stay true to the idea that when cooking with wine, if I wouldn’t want to sip it, then I shouldn’t be cooking with it. I asked for a recommendation for a medium- priced dry white for cooking — not Chardonnay — and the clerk said, “Use this — you’re not going to taste it anyway.” Seriously? 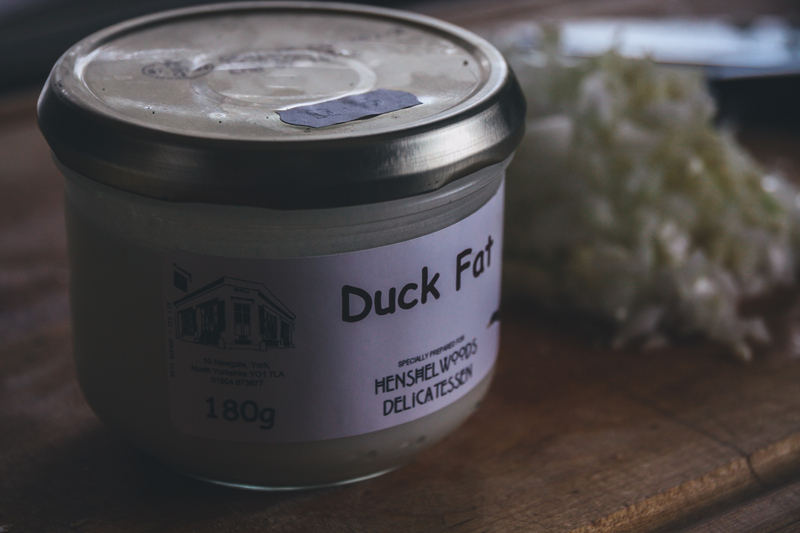 On the duck fat: I had a very small jar, and that’s what I used for the entire recipe. All in all, less fat added. I used Panko for the crumb top, which never quite became a crust, so there was no “cracking through the crust” to spoon out juices and repeat, because there was so much moisture in the pot. 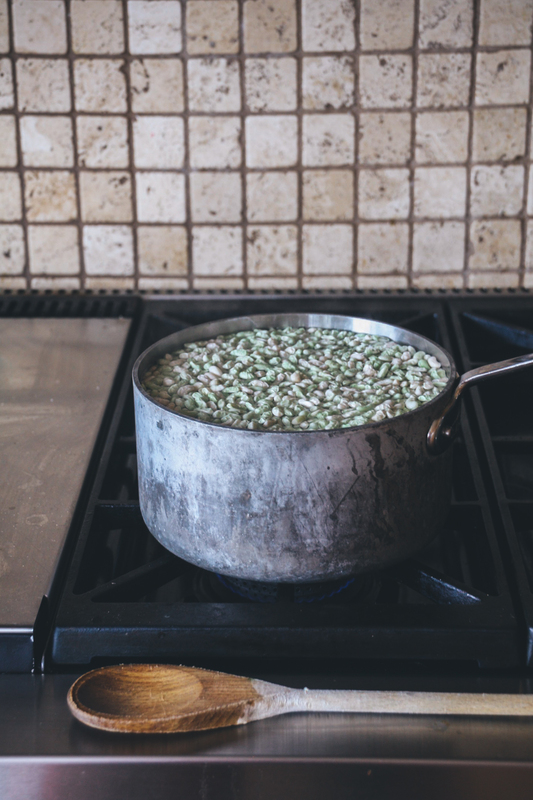 Many recipes discuss preventing the beans from drying out, but that wasn’t the case with this recipe. I blame it on the lamb juices which seemed more than plentiful. I even tried to reduce the juices, but that intensifies a flavor that not everyone is completely comfortable with. 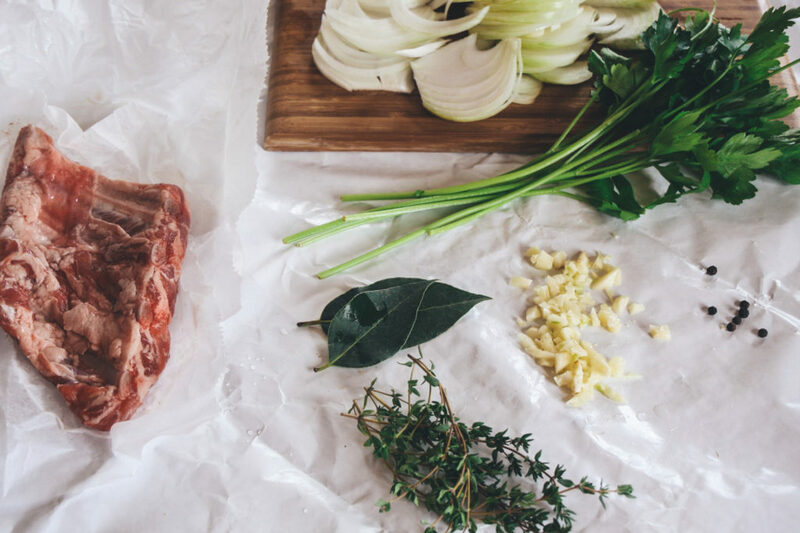 If there was ever a thought in your mind about not completing the mise en place it would be a huge mistake to do so with this recipe. Prepare everything for all aspects of the recipe ahead and have them ready and waiting to be used. Speaking of making ahead, there are lots of ways to do that when you consider most of the prep is for each separate component. It’s not a challenging recipe — it’s just involved. If you prep the pork loin and lamb and refrigerate them, plus soak the beans the night before, the rest of the work is layering the cassoulet. Easy peasy. Count the pots you’ll need to cook with, or think ahead about what you’ll wipe out and immediately put to use again.